The inaugural round of the new for 2014 K-Tec Racing Clio 182 Series provided the two of the best races of the day with ex-Stock Hatch champions Patrick Fletcher and Jeff Humphries fighting hard to take the first victories. Mark Armstrong, who put his Clio on pole position for both races, was unable to compete in either race due to an engine failure in qualifying which meant that Caterham graduate Dan Livingstone was on a lonely front row. 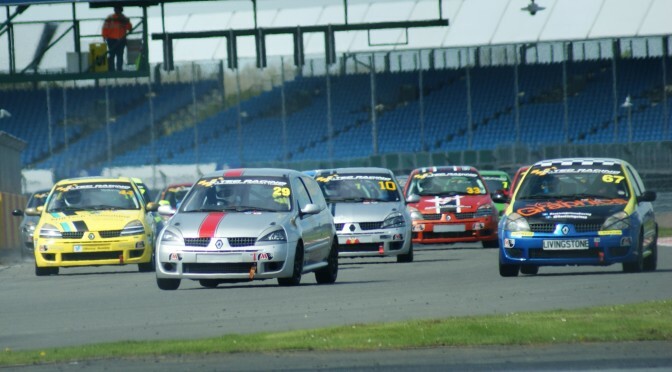 A storming start from the outside of the second row put 2011 Stock Hatch champion, Patrick Fletcher into the lead at Copse. He pulled clear of the pack by a full second on the first lap ahead of Mark Hammersley and Livingstone. However, it was Jeff Humphries who started in sixth that would work his way up into second place by lap three as he prepared to hunt down Fletcher. Humphries, who won the Stock Hatch title in 2009, whittled down a two second gap to challenge Fletcher but was unable to find a way ahead of him.